#18: Indoor winter scooter storage? I have a scooter that I plan to keep in storage for this winter. 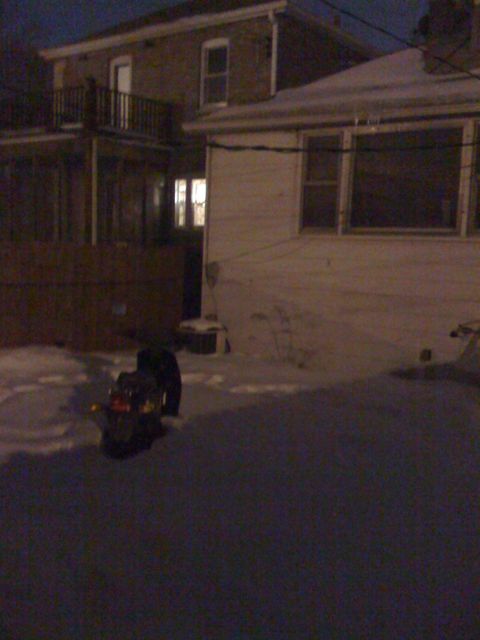 My plan is to keep it in the basement of our 9-unit building, but I want to be sure that I do everything necessary to both 1, avoid the scooter becoming a fire hazard and 2, ensure that the scooter operates well for the spring unveiling. Video of a Rattler with a ski kit installed, on an actual mountain. Rumor has it one was on display at the sale over the weekend. CWC look out! Speaking of which, I’ll have the CWC entry page set up ASAP. Following last Saturday’s ride/party, the 2009-10 is officially underway. Complete rules and entry information are coming soon, but you can look at last year’s CWC page to get the idea. Which reminds me, I still have Bob Hedstom’s Malört, haven’t been up to Minnesota for ages! Author illnoisePosted on 16.11.09 Categories Cold Weather, Rallies and Rides1 Comment on CWC underway! 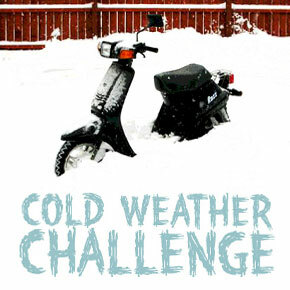 A reminder: Join 2strokebuzz tomorrow (Saturday 11/14) for the Cold Weather Challenge Kick-off. The ride (map) leaves from the Kat Klub at 5pm, we’ll stop for burgers and ice cream, and return to Kat Klub for Berryoke at 8pm. Heather Parker came over last night to shoot some photos of Pudge. She’s so good. Actual scooter content is resuming soon, promise! If you didn’t notice the ad on the site, we’re kicking off the Cold Weather Challenge next Saturday (11/14) with a ride and Berryoke party at the Kat Klub, be there! A scuffed-up Primavera too late (grrr leaves), here are some Fall and Winter riding tips via Scooterism via Scooterdiva, who also offers some good winterizing tips. Today’s the last day of the Cold Weather Challenge, and it’s getting pretty damn cold in some parts. Tell you what, you’ve got an extension, until midnight Sunday, to beat Scootervillan and his Vectrix. Also, ALL state-by-state leaders get a consolation prize, so if you’re in a state with no entries, a 10-mile ride this weekend nets you a sticker. Do it! Scrambler17 asks “We had a bit of a warm spell over the weekend. Is the Razz still hanging in there?” It sure is. I went over last night and took this photo. I would have never believed on January 9 that the same snow would still be covering the floorboards of Ryan’s Razz, with a few new layers on top of it, all frozen as hard as a rock. But there it is. This weekend is supposed to be rainy and above freezing, but I bet that just adds a thick ice bridge that holds it up for another couple weeks. This winter will never end. Out of respect for the pessimists that guessed (a month ago) that it’d fall over this week, we’re only accepting new bets for dates after Valentines’ Day. If you’re headed to one of the remaining 2009 Cycle World International Motorcycle Shows, use the code SCOOT! for $2 off each ticket.